Not for the first time, our waiter asked, “How is the food, ma’am?” while looking at my husband, which was confusing to both of us. He also inquired as to whether it was OK to remove plates we were clearly done with, given that they were entirely bereft of food. Offered us more bread only after we were pretty much done our entrees. Kept trying to refill our sparkling water glasses with regular water. Initially forgot to bring us the dessert course. And somehow, we didn’t mind at all. The waiter was good-natured, and was definitely trying to do a good job. And the food—which was very good—was $20 for three courses. That’s $20 Canadian for the whole meal. 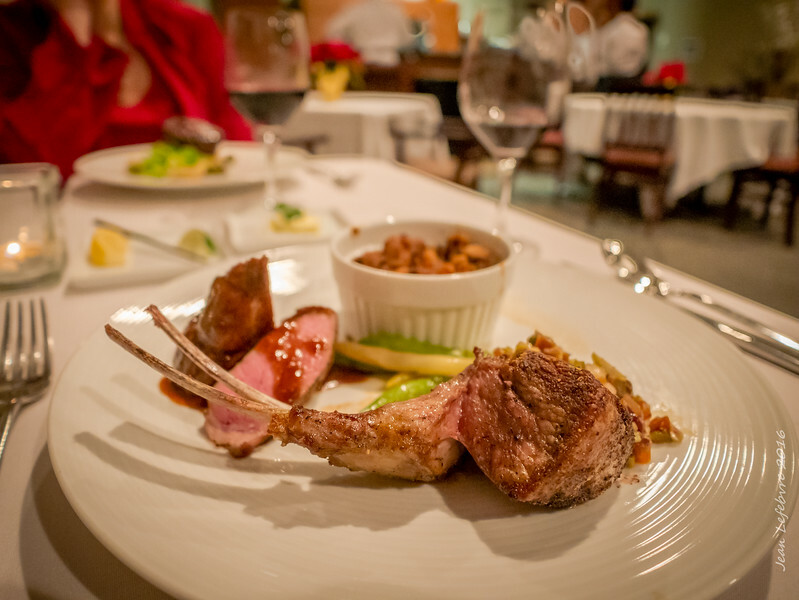 Despite including items such as beef tenderloin, lamb, foie gras, and fancy French cheeses. 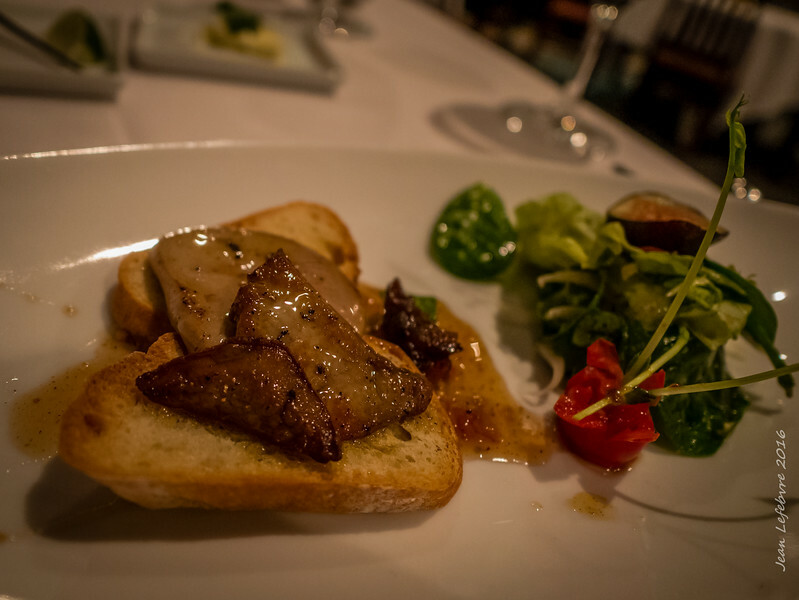 When foie gras alone is typically over $20 at a “regular” restaurant, that kind of a deal can buy you a lot of good will. Yes, last Wednesday, for the first time in some time, we returned to Bloom restaurant at Conestoga College, where students’ training for a possible career in the hospitality industry includes running this restaurant open to the public—under the watchful eye of people who know what they’re doing. This week’s theme was foods of Southern France. They went all out in trying to give us a French restaurant-like experience, starting us with an amuse bouche of mushroom and cheese. 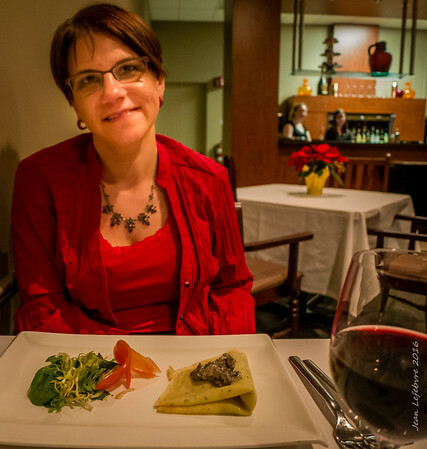 As appetizers, while Jean enjoyed his foie gras, I had a very nice wild mushroom crepe. 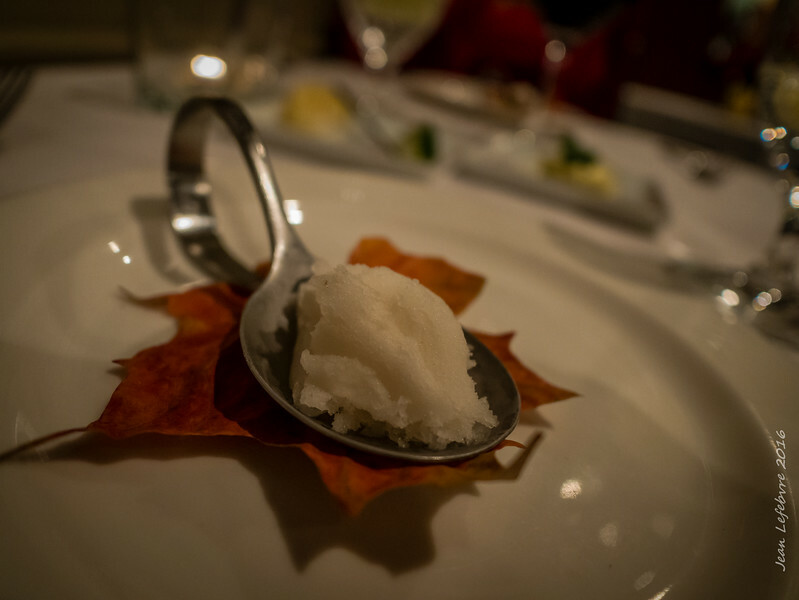 We then received a palate cleanser of pear and brandy sorbet. Couldn’t taste the brandy much, but it was nice and refreshing. And pretty. The managing chef made the rounds of tables as we were waiting on our dessert (which they scrambled to deliver once they realized it was missed). They had no decaf espresso, so they made us a latte of decaf roobois tea, which was pretty good. 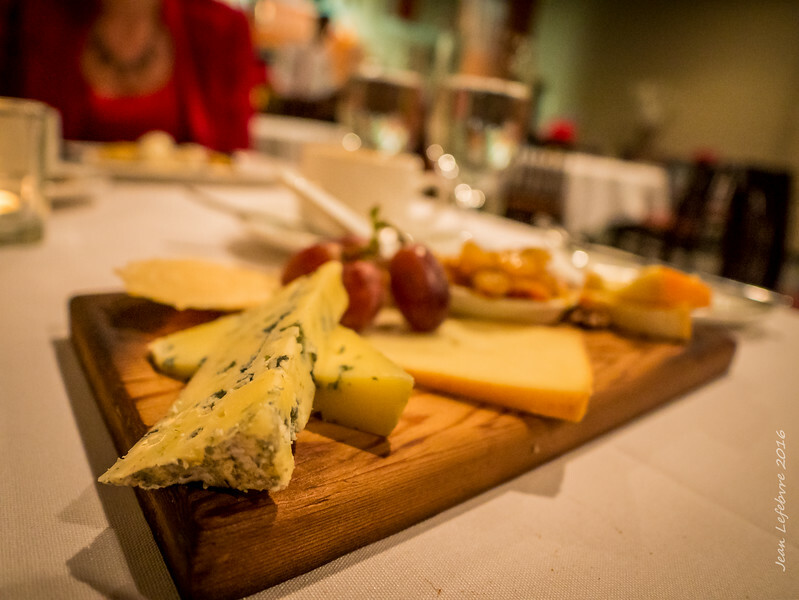 Jean had wanted the apple dessert, but they were out, so he managed with the cheese plate. I had a deconstructed blueberry tart that was light and delicious. Dining at Bloom is an experience worth having. The service hiccups are just part of the charm. Categories: Food | Tags: food, photography, restaurants, Waterloo, waterloo region | Permalink.